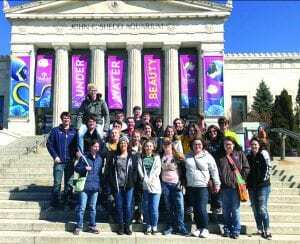 The GHS senior class spent last weekend in Chicago as one last group activity before graduation. One of the highlights of the trip was a visit to the Shedd Aquarium. Pictured are (boys in the back, l to r) Preston Worth (Carmen and Bart), Calen Decker (Rick and Kari), Dawson Simon (Pat and Diane), Cole Nafziger (Deb and Kris), Taylor Frost (Cindy and Don), Kolten Kirby (Kelly and Renee), Shad Sharp (Missy and Danny Meinke/Matt Sharp), Aaron Smith (Vern and Nancy), Peyton Drew (Deryk Drew/Sheri Drew), Bishop Meinke (Danny and Missy Meinke, Candi Felts), Cody Brooks (Mary Beth Holzwarth), Brody Genzler (James and Kristie). Girls upfront: Jenny Wheeler (Janelle Wheeler/Ed Wheeler, Jr.), Allicia Head (Stacy Shaunaman), Nadyne Eckstrom (Margot and Ryan Lake), Mim Knoble (Steve and Marcy), Miya McCloud (Makenzie Hall/Andrew McCloud), Piper Jost (Trish and Jeff), Shaelyn Schatz (Mark Schatz/Sheila Schatz), Autumn Wieseler (Ben Wieseler/Deb and Justin Cronin), Amber Flatt (Theresa and Kenny Goebel), Avery Dutt (Lynette), Paige Worth (Carmen and Bart), Shaylee In The Woods (Jenny Thomas), and Cameron Beetsch (Cory and Jenny).